Your room says a lot about you, and I couldn’t agree more. But when you’re decorating a room from scratch, it can be a huge challenge to stay true to yourself and not alienate yourself from your own space. Believe me—I recently experienced it for myself! Along with my parents, I moved into a brand-new house last year. After all the architectural and construction-related decisions I made, decorating was the next big hurdle to overcome. Preparations started way before the new house was done, but the day we moved in my room was still a shell with bare walls and boxes waiting to be unpacked. I only had one piece of furniture the first night—my grandfather’s that I brought from our old house. Sleeping in an empty room was a strange feeling, one I was determined not to experience for too long. So the day after we moved I set out to make my room much more like a home and much less of the empty shell it was. True enough, this process put me face-to-face with my personality and needs. It was as much a learning experience about myself as it was a decorating spree! I divided my room into three main spaces, based on the three things I plan to do in my room: a bed and resting area, study space, and a vanity. I also chose a general look and feel for my furniture and decor: everything was either light wood finish, white, or a pastel shade. That helped me narrow down my choices, and made my room a lot more cohesive! The first area that came together was my vanity. When we had just started building the house my mom and I began looking around for furniture, but I couldn’t find a dresser I liked and could imagine in my new room. Since my mom was having a few pieces of furniture custom-made, I decided to have my dresser made as well. I knew what I wanted: a big mirror, drawers for extra storage, and a clean, white finish. Having it custom-made gave me the freedom and flexibility to get exactly what I want! Then I found this light wood chair at Home Depot (that matched the shade of my floor!) 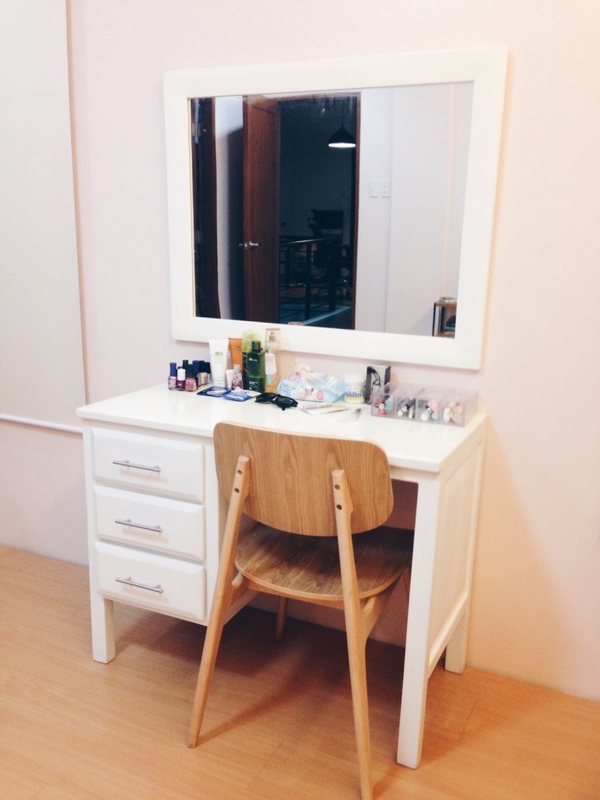 to give my vanity area some contrast. A few weeks later, I added a bright blue throw pillow to make the space cozier. Once I fixed the vanity area, my study was up next. We ordered work tables with matching drawers and chairs for my room as well as our second floor den, and those were delivered soon after we moved in. 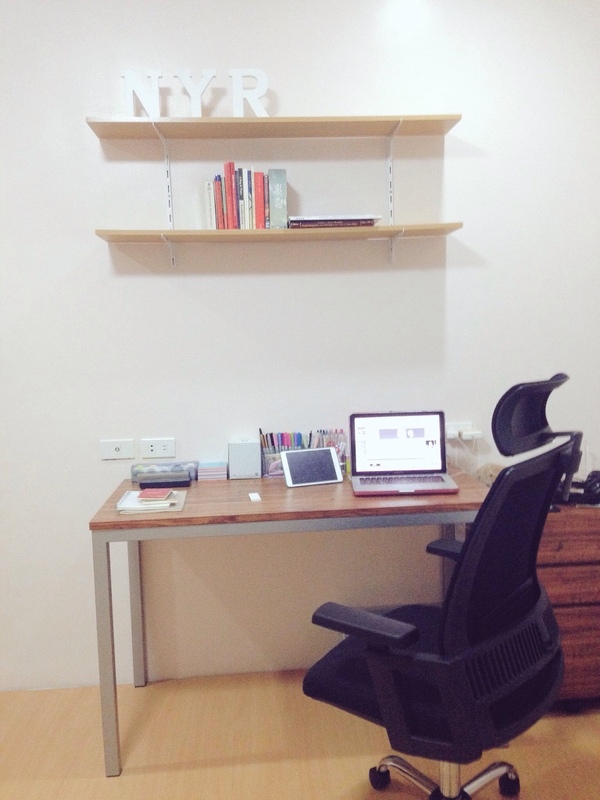 As a writer, I spend a lot time at my desk so I needed a big, functional workspace. 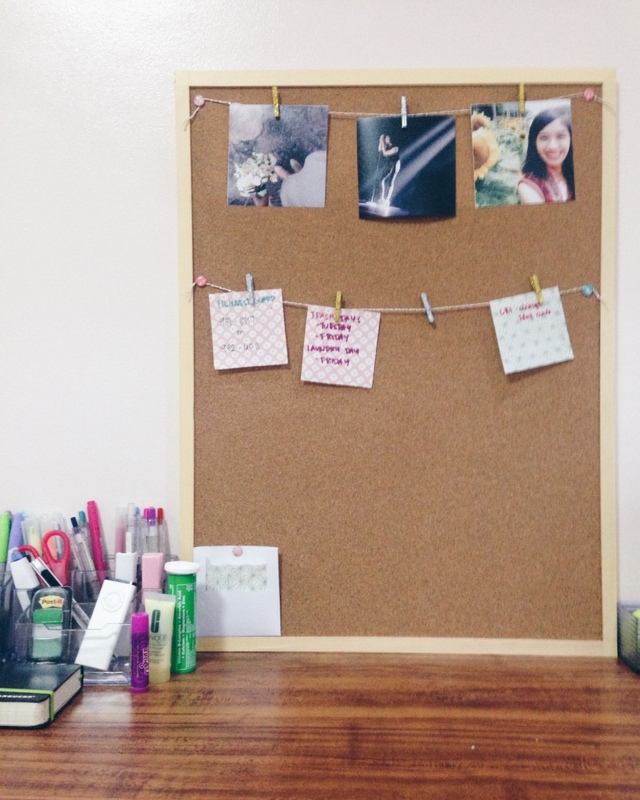 I added a cork board, all sorts of organizers, and filled the space with my essentials. I also have 6 electrical outlets to the left and right (and a ready phone connection!) which is perfect. For extra space, I installed 2 floating shelves. Of course, as a literature grad I had a lot of books with me when we moved. 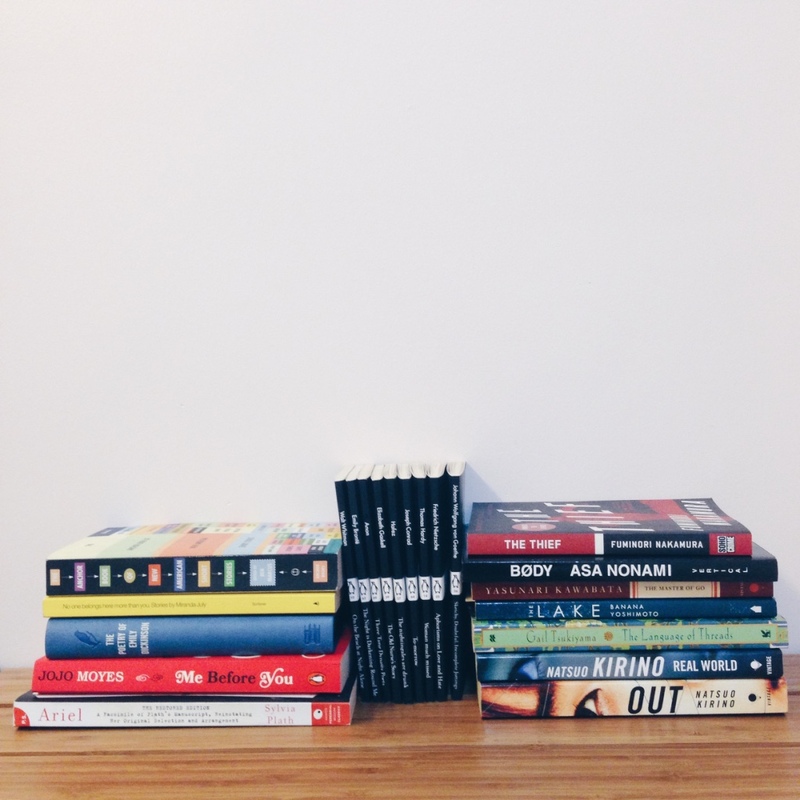 I had a lot of fun arranging and decorating some of my go-to books and magazines on the floating shelves! While other people don’t like mixing work (or studies) and personal things, I feel the need to do just that. I’m a workaholic, so most of my time is spent reading, writing, and just being productive. If I don’t mix fun and personal things into my work I might go crazy! 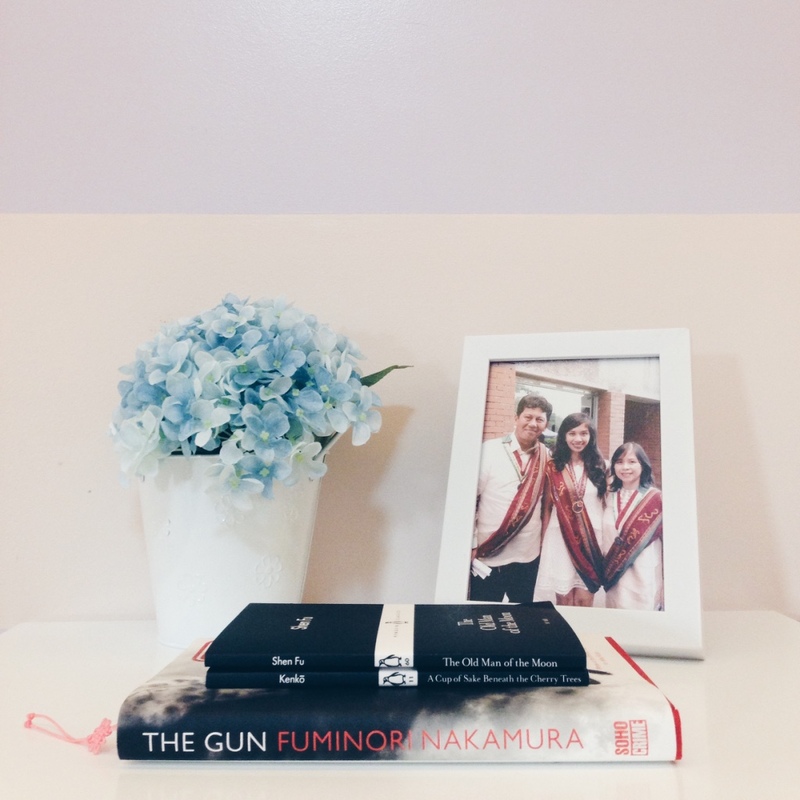 So while my floating shelves have a lot more stuff now, the sentiment is still the same—one shelf is for books, and the other for photos and touches of decor. I kept everything clean though, plain white frames and letters as decor, and cherry wood to match my floor and other wood furniture. Speaking of books, of course I needed more than just floating shelves to store my books. While most of them are in storage, I keep my favorites out in my room for easy access. Reading remains my main de-stressor, and working in a stressful industry means I need to read a lot! So in my rest area, I have a small 2-level shelf. One level is for my bags and everyday utilities, and the other is for more of my go-to books. It’s at the foot of my bed, so sometimes I don’t even have to stand up to reach for a book! I also have a bedside table which is simple and clean white like my vanity. It’s a lot messier now with medicine and all sorts of lotions, but when I was decorating it I made sure to make my dresser pleasing to the eye. It’s the first thing I see in the morning, and I want to wake up looking at nice things! As usual, I have more books on my night table. I also have a family photo (in the same white frame as the ones I used on the floating shelves) and a faux flower arrangement. I love the blue hydrangeas! 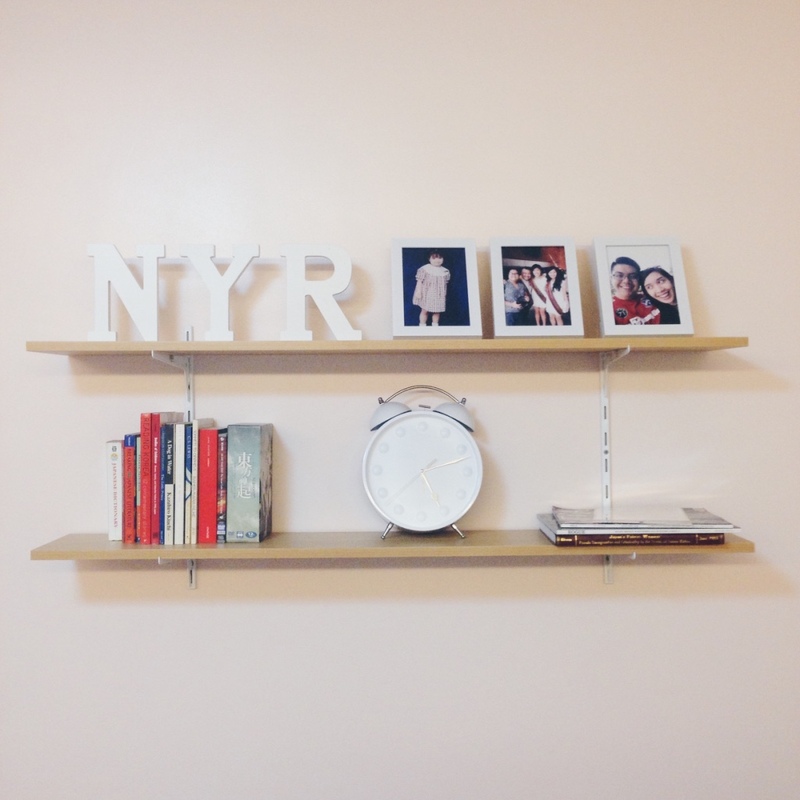 They give my pink, lavender, and white room a pop of color, without being too loud. It’s been almost a year since we moved in, but only a few months since I stopped decorating my space. I think my room will evolve more as time passes, so I’m never completely done with decorating! My walls are still a bit bare, especially the ones without windows. I might hang a painting in the future but I’ll have to find the right one first. My room will always be a work in progress, and I like it that way. Nicole has been a writer and blogger for over a decade now. Currently an account manager at an advertising agency, she’s a workaholic who loves creating—whether that means launching the next big social media campaign or decorating her room. Hi Dechie, you’ll find the photo of the bed in Part 1 – http://www.myboysen.com/room-designing-room-scratch/. Happy reading. Hi, i would like to ask the author to help me organize and design our little haven. I wish to have our small rented room organized and colorfully designed. Thank you for reaching out and congratulations on having your own haven! That’s a huge and exciting step! The author Nicole is an account manager of an advertising agency, and is a contributor to our blog. She shared her own experience in this post. The BOYSEN blog Let it B wants to inspire people to do something special about their own living spaces, but we do not offer interior design services. Because different people have different responses to color, we recommend that you visit our Mix and Match website at http://www.mixandmatchcolors.net/. Mix & Match is an interactive tool that allows users to experiment and play around with various colors and color combinations using different scenarios. In this manner, you may easily view and picture the different color combinations that will match your preferences. Because it is personalized, the tool can help you select the combination that will suit your personality. Please try it! On the other end, if you’re into following #WhatsTrending, you may also visit our BOYSEN Color Trend website – boysencolortrends.com. Here you can see the trending colors this year, and even those that were trending last 2015 and 2016. There are also room sets that can serve as inspiration. Hope this helps!